Each year during the festival of Simchat Torah, Jews celebrate the end of the annual cycle of Torah readings by rolling the scroll back to its beginning and starting to read again. The message is clear: Each year, we can grow to understand the words of the Torah in new, and often deeper, ways. We are guided not only to listen to Torah, but to respond to it, to discuss it, and to wrestle with its images and stories. Though the written word has been the primary vehicle for reacting to Hebrew scripture, Jewish culture offers another important–and frequently overlooked–modality for commenting on the Bible: visual art. Though many Jews and non-Jews alike mistakenly believe that visual images are prohibited by Jewish law, art has played a prominent part in transmitting biblical stories and making them meaningful for each new generation. By examining biblical images in Jewish art, we can grow to understand how generations past may have interpreted characters and stories that we still wrestle with today. In 1932, American archeologist Clark Hopkins unearthed one of the greatest archeological discoveries of the 20th century: a synagogue located in what was the desert city of Dura-Europos (now part of present-day Syria). This remarkably well-preserved synagogue contains walls painted with images of people and animals from the Hebrew Bible. An Aramaic inscription helps to date the synagogue to 244 C.E., when a group of exiled Jews would have formed a community of worshippers in what was then a Roman trade city, settling there with a melting pot of Greeks, Byzantines, Persians and Christians. The large-scale art in the synagogue helps to dispel the myth that Judaism historically prohibited visual images. Indeed, the often-misunderstood second commandment–which prohibits “graven images”–refers specifically to the creation of idols, not to artistic pursuits in general. This commandment was interpreted differently in different times and circumstances–sometimes more literally and sometimes more loosely. The murals in the Dura-Europos synagogue lead us to believe that early rabbinic Judaism may have acknowledged and even celebrated visual art as a vehicle for honoring and transmitting sacred texts. The 28 paintings in the synagogue include depictions from the Five Books of Moses (Torah), such as a painting of the akedah (binding of Isaac); a vine resembling the Tree of Life described in Genesis; the patriarch Jacob blessing his sons; and scenes from the Exodus. In addition, murals depict a lyre player, whom many scholars interpret to be King David, a portrait of the prophet Elijah, and scenes from the Book of Esther. In examining the paintings, scholars have tried to deduce how the people who created them saw their connection to the text and its application to their lives as Jews. For example, four panels containing portraits of Moses show the Jewish leader in white robes with his palms open. Around the time these were created, Christian artists were painting portraits of Jesus in their churches, and so the Jewish artists may have been attempting to create a Jewish hero or leader of the same scale. Sometimes the placement of the art also gives us clues about the practice of Judaism at that time. The portraits of the Book of Esther, for example, are on the wall where the women’s benches were located. 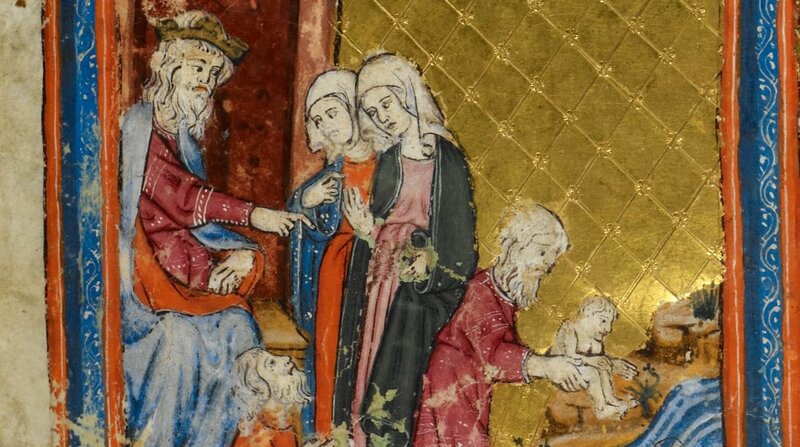 The Babylonia Talmud records that it is compulsory for women to attend the reading of the Book of Esther each year–possibly explaining those paintings’ placement. The scribal arts have long played a vital role in transmitting Torah. Fragments of manuscripts from as early as the ninth century show a distinct style of Hebrew script used to write holy books. But in the medieval period, the scribe was not the only person who worked on creating sacred Jewish texts; when his job was finished, the scribe would often pass off the manuscript to an illuminator, who painted detailed artwork around the text on each page. The illuminator would first draw the image on the page, and then, in many cases, would apply gold leaf to the text, making it even more ornamental. When illustrating Hebrew Bibles, the artists might depict images and icons from the stories. In examining some manuscripts, we discover that many artists dealt with the prohibition against creating graven images by illustrating human bodies with animal heads. The preserved Bird’s Head Haggadah from Germany, dated to 1300, is a prime example of how the Jewish community struggled with the question of how to interpret the second commandment while recognizing the importance of illustrations. The sheer number of illuminated manuscripts from this period shows how important the visual element was in conveying the biblical stories. Each manuscript reveals different interpretations of the stories by the artist, and some include depictions of midrashic stories–those created by the rabbis to explain or interpret a Biblical story. Some of the art is very literal and true to the stories, while other artists render biblical subjects with romantic longings. Paintings of King David playing his lyre, for example, are often set in a very bucolic setting, with David depicted as both a shepherd and musician, blessed with an almost God-like aura. Moses also is sometimes painted as an almost-divine leader. In all likelihood, the artists’ interpretations of biblical characters mirrored the prevailing beliefs and understandings of Jews of the time. Bibles were not the only manuscripts that were illuminated–siddurim (prayerbooks), mahzorim (High Holy Day prayerbooks), and other Jewish books were also laid out with visual illustrations. The most common illuminated books that remain are the Passover Haggadot, featuring different artists’ depictions of the Jewish people as slaves moving toward freedom. These books also frequently included illustrations of the Jewish people engaged in the many rituals and prayers that made up their daily life. This art conveys displays the artists’–and their communities’–emphasis on living a pious life whose focus was Torah, prayer, and mitzvot (commandments). Jewish artists did not become part of the fine-arts tradition until the period of the Enlightenment, when they were permitted to leave the ghettos and enroll in secular universities and academies. In the 19th century, Jewish artists begin to emerge and receive attention from the larger communities around them. Nineteenth-century artist Daniel Moritz Oppenheim is often thought of as the “first Jewish painter” because of his frequent depictions of the domestic life of the Jewish people around him. Many of his paintings focus on Jewish holidays and lifecycle events, and he earned his greatest recognition for painting portraits of prominent Jews and non-Jews of his time. Oppenheim’s art occasionally deals with biblical subjects. These include romantic paintings of Moses and the tablets and Moses passing his leadership to Joshua. Many of the Jewish painters who came to prominence after Oppenheim did not explore Jewish themes or subjects in their art at all. The great exception is the painter Marc Chagall, whose work fused a folk style with a very modern sensibility. Imagery of Chagall’s youth in Russia–Jews in traditional clothing, farm animals, books and Judaic items–appear throughout his work. Though he came from a traditional Jewish upbringing, Chagall’s paintings seldom explore biblical themes as subjects. The major exception occurred late in his career, when Hadassah Hospital in Jerusalem commissioned Chagall to create 12 stained glass windows representing the 12 tribes of Israel. In them, he fully explores a different biblical theme in each window. Here, his work is much more interpretive and symbolic than any of the artistic Jewish Bible imagery that had come before him. Chagall uses color, animals, and even symbols from the zodiac to depict the emotional and spiritual quality of each tribe of Israel. The Hebrew Bible comes back as a subject to be reckoned with by many artists in the latter half of the 20th century and into the beginning of the 21st. For the first time, Jewish women artists began to add their voices and visions to the interpretation of biblical texts by creating art that not only depicts but clearly comments on the text. This kind of interpretive art is sometimes called visual midrash–using visual imagery to create an imaginative language that interprets biblical texts through contemporary eyes. It remains a popular endeavor for Jewish artists of widely different backgrounds.